If end users had their druthers, security systems would never stop working. However, like any complex system, pieces break and things need periodic adjustment. 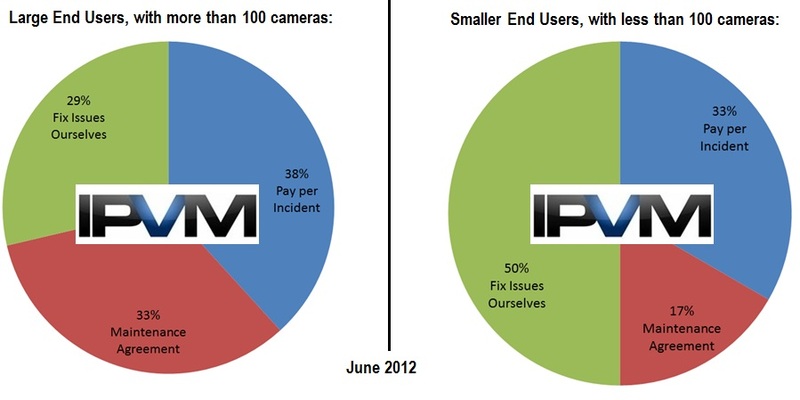 How do end users prefer to buy maintenance services for surveillance equipment? We asked a group of globally located end users that question. In this note, we analyse their votes and breakdown their responses. A number of methods of maintaining security equipment exist. For many, the simplest strategy is to call the repairman when something breaks. Others prefer to buy a maintenance agreement so that the 'cost' of service is controlled and predictable. Still others simply chose to fix the problem themselves, avoiding having to pay for service altogether. These charts indicate the differences, but they do not explain the rationale behind them. We asked end users to explain their answers, and even with answers coming from diverse markets, answers fell into common groups. The strongest answer from end users were that formal maintenance agreements do not deliver enough value to justify their cost. Some responses suggested that integrators do not deliver on the expectations of the contract, and really see agreements as little more than an opportunity to take money with little in return. "Service contracts benefit only one party: the vendor." "Vendors never write up a service contract they're going to lose money on." "I can control costs better without one." "We paid initially for a service contract but didn't use it enough to warrant the cost." "Being a non-profit volunteer based organization we cannot afford the ongoing service contracts." "On going service contracts have not worked well. Usually more expensive than Time and Materials (per incident)." "Our service contract ended and the renewal rates were exorbitant." "Too little is actually covered by the contract. Everything ends up costing money anyway." "It's cheaper and more efficient for us to do the work ourselves"
"Service contracts mostly seem to be unsuccessful in providing timely and cost effective support." "The cost of a service contract for 800+ camera's is far too expensive to justify"
Some of the smaller system users suggest they have no option to hire outside help, and must fix problems on their own. However, many end users in both categories suggested they have built up staff and expertise to the point they manage maintenance themselves. This selection was the single most popular answer in the larger system user group, which indicates that even when an end user has money to purchase outside maintenance labor, they still prefer to handle these activities in-house. "We have a team of technician in electronic in our units to achieve the jobs"
"I have the technical background to make repairs myself." "we have the in house skillset"
"Many times we do fix it ourselves." "We try to fix most things ourselves so this made the most sense for us." "Since we typically purchase and install the equipment, we also repair and replace them." "We fix what we can, when something breaks since there is no dedicated surveillance budget." "Have on site maintenance people who are familiar with system." "As long as I have a good team of in-house techs, the value of a service contract never seems to equal what a vendor charges for them." For many years, the standard method of buying maintenance was opening a service call with an integrator on an 'as needed' basis. For security users, this remains a popular option for a variety of reasons. Some users suggested they are able to better control the cost of maintenance on a 'time and materials' basis, while others suggested this is an escalation step in a 'maintenance triad' for problems that cannot be fixed in-house. "Time and materials approach and depot repair processes are generally better for us." "We usually do time and material. On going service contracts too expensive." "We make yearly decisions to consider a pay-per-incident." "Big problems are handled by integrator on a per-call basis"
"T and M, only when needed. Saves money." "No budget means repairs only as needed." "If we can't fix, we place a call." "Can plan better for expenses"
"Executive Management team knows what our Service costs will be." "Maintenance contracts are easier to budget." "Spread risk and cost over a fixed period." "It seems the best possible way to hedge against later budgetary cuts/restrictions." Some end users answered that their security budgets fall under 'allocative' type budgets, where they must previously ask for funding for maintenance in order to receive it. Unpredictable costs are not funded, so maintenance becomes an expected, calculated cost of operation.